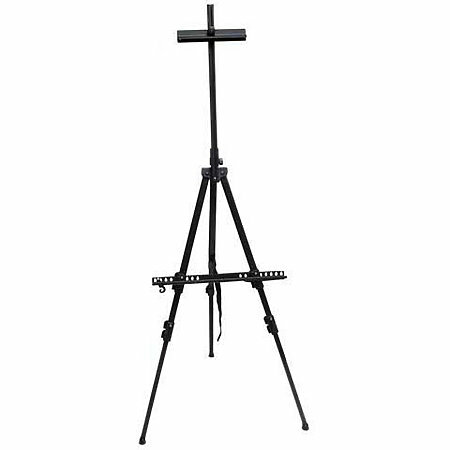 Great for indoor, outdoor or table top use, this stable light-weight metal easel is great for painting, sketching and display in both horizontal and vertical positions. It accommodates canvases or panels from 3"- 36" in the horizontal position and up to 69" high in the vertical position. This versatile easel works equally well with thin panels, standard .75" Studio canvas or 1.5" Gallery canvas. Also features a swing-out brush holder, water bucket hook and telescoping legs with pivoting, non-skid rubber feet. Includes a carrying case with shoulder strap and pocket. Weighs 4 lbs. Fully assembled, includes adjustment instructions.